For those of you who liked the last blog about one of nature’s little oddballs (the aardvark, if not the writer), here’s another example that evolution does have a sense of humour. The bat-eared fox may belong to the same family as other meat-munching foxes, dogs and wolves, but bat-eared foxes live mainly on a diet of insects. Their sharp teeth crush the outer cases of bugs and other insects’ bodies, allowing them to carve out a niche living in a harsh environment. 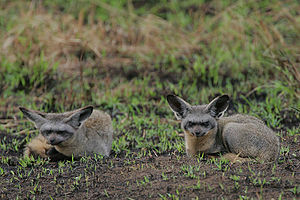 Bat-eared foxes even have eight additional molars to help them grind up termites, juicy dung beetles and similar prey. 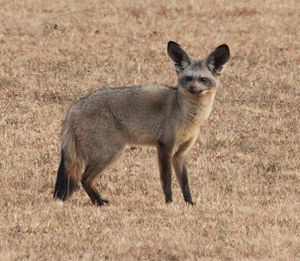 Bat-eared foxes thrive in hot climates like the savannahs or deserts of Africa. Their large pointy ears have super-hearing, which picks up the smallest noise made by its insect prey. These foxes have quite long, shaggy fur, which forms a parting on their back, making them look even more like an oddball among the otherwise beautiful fox family (officially known as Canidae). Bat-eared foxes also have pointy little faces that remind one of a Chihuahua or Dobby the Elf (J K Rowling, Harry Potter books) rather than a fox. Having recently indulged in a WP conversation with one of my blog readers about the various aspects of beauty – mainly was Yoda the ugliest dog or do we just have ugly, brain-washed minds that make us think, anything that is out of the ordinary must be ugly – I feel that the bat-eared fox is a fine example for the old adage that beauty is in the eye of the beholder. Among the 21 different varieties of foxes found on our planet, the bat-eared fox is unlikely to win a beauty contest, yet its qualities make it rather endearing…a bit like Yoda, who hung on to life well beyond the normal life span allotted to our pets. A survivor against the odds the bat-eared fox makes a niche living among much larger hunters with which it shares its habitat. We may not think that Yoda the dog or Batty the fox are beautiful in the conventional sense, but I’ve always been a sucker for the underdog (if you’ll pardon the pun) and we can admire tenacity in the face of adversity and an iron will to fight on, even when there’s no guarantee of succeeding. My heroine Willow the Vampire is therefore not the most beautiful vampy child that ever walked a moonlit night. In fact, I wanted her to look quite ordinary – as far as vampires can look “ordinary”. Over time, she will discover the qualities that make her beautiful in the eyes of those dear to her, her family and friends. Well, the ugly git tries much harder to win her affections and to keep them – while the handsome guy tends to rely on his looks to make a quick conquest and then stops bothering. Even beauty queens and fashion models long for affection and lasting relationships. Willow the Vampire is unlikely to ever turn into a teenage vampire with ravishing looks that will “bag” her a heart throb of the Twilight ilk, but during the course of my book she learns to discover her own inner beauty…in that she is lucky, since not all of us are blessed to do so. I know, I’ve always had this thing about ears…as a small child I fell in love with Stan Laurel, when I saw a film in which he flaps his ears…I think it spoilt me for other men…and gave me an ear-obsession. Yoda the dog and Batty the fox may not be the most attractive creatures, but they’ve got bags of character! A face only a mother could love :). that such pupils exist but they are rarely 100% bad. I look forward to reading more of her adventures.